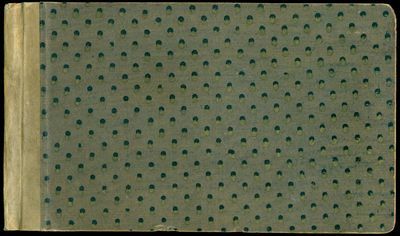 [Np 1917 - Approximately 22 x 11 cm, in contemporary mat (the latter 35.5 x 25 cm). Mat edgeworn and somewhat dust darkened, with a few minor spots, but generally very good. A charming period drawing, inscribed as a gift to his model, Hildegarde Hirsch on the mat: "To Hildegarde on her sixteenth birthday. Rockwell." There is also a small 'H' in the lower right foreground of the image in his hand. Hirsch was a performer with the Ziegfeld Follies, and was both Kent's model and his lover. "The reference to 'sixteenth' birthday is facetious, as there is evidence that she was in her 20s when they met and may have been married and separated prior to the relationship with RK" - Stanley, REDISCOVERING ROCKWELL KENT. 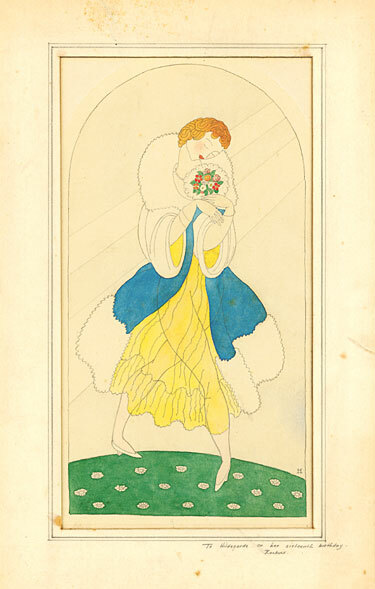 The drawing was published, without color, in the November 1917 issue of VANITY FAIR. GROLIER (STANLEY) 9. Heinrich KIEPERT (1818 - 1899) / Richard KIEPERT (1846 - 1915). OTTOMAN EMPIRE WALL MAP / WORLD WAR I WITH MSS. 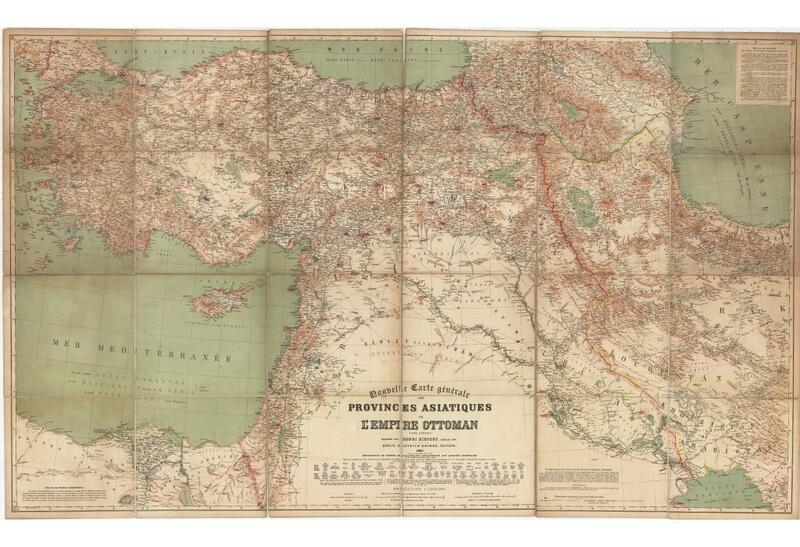 ADDITIONS:] NOUVELLE CARTE GÉNÉRALE DES PROVINCES ASIATIQUES DE L'EMPIRE OTTOMAN (SANS L'ARABIE) DRESSÉE PAR HENRI KIEPERT, BERLIN 1883. CHEMINS DE FER D&#146;APRÈS L&#146;ÉTAT DE 1917. Berlin: Dietrich Reimer (Ernst Vohsen), . 1917 - Chromolithograph, dissected into 24 sections and mounted upon original linen, contemporary manuscript additions in red and blue crayon, original sellers label of Simon Schropp & Co. Berlin affixed to verso (Very Good, some minor toning; clean tear to linen along one of the panel seams, since repaired), 93 x 156 cm (36.5 x 61.5 inches). A unique example of the very rare 1917 edition of a colossal map of the Ottoman Empire in Turkey, the Levant and Iraq, originally composed by the eminent German cartographer Heinrich Kiepert, but updated to become the finest general map of the region available during World War I, importantly with extensive contemporary manuscript additions highlighting key garrison towns, or possible military targets, in the ongoing war, likely added by a Central Powers officer. This is a unique example of the finest general map of the Near East and most of the Middle East available during World War I, being the ultimate edition of Heinrich Kiepert&#146;s gargantuan masterpiece. The work depicts the heart of the Ottoman Empire, including Turkey, the Levant (modern Syria, Lebanon, Israel and Jordan) and Iraq; plus, adjacent regions, including parts of Persia (Iran), Egypt and the Caucuses. Considered to be by far and away the era&#146;s most detailed and accurate geographical overview of the region, the first edition was compiled in 1883 by the foremost authority on the cartography of the Ottoman Empire, the German geographer Heinrich Kiepert, and is here significantly updated to 1917, taking into account the partial construction of the famous Bagdadbahn (Istanbul to Baghdad Railway) and the Hejaz Railway, which connected Damascus to Medina (here partially shown). This edition of the Kiepert map is especially interesting and important, as it was made specifically to be used as a strategic aid by Central Powers commanders during World War I. The war in the Near and Middle East was heavily determined by geographic variables, and perhaps no other map better showcases these factors, providing a panoptic overview all in one place. The present example features extensive contemporary markings in red and blue crayon highlighting key garrison towns and potential military targets, likely added by a German or Turkish officer. We are not aware of another example of the Kiepert map with wartime manuscript markings, making this a rare example of the best regional map of World War I, bearing direct evidence of wartime use. SEE OUR WEB PAGE FOR LONGER DESCRIPTION. , , . 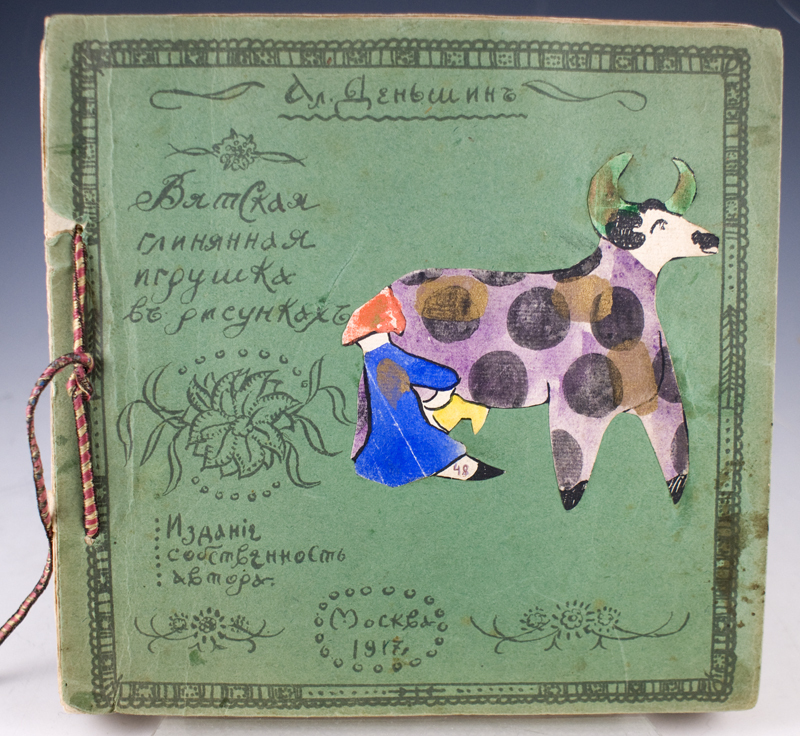 Taccuino originale a china con disegni a matita, intitolato "The History of the Belle and le Bestie (Beauties + Beasts)". Il primo disegno è datato "31 luglio 1917" mentre l'ultimo reca la data "Xmas 1918". Firmato all'ultima pagina di testo "Jess". Il taccuino è composto di 48 disegni a matita datati e altrettante pagine scritte in inglese a china con calligrafia fitta e minuta. "Si tratta di una descrizione della vita di Jessie e di Cesarina, le Belle, a Cereseto e a Torino dal 31 luglio 1917 al dicembre 1918. I personaggi sono solo persone della famiglia Gualino: oltre al "bel Riccardo", ci sono i genitori e il fratello di Cesarina Ermanno con la divisa (sono anni di guerra), la sorella Edmea, il Maestro Egidio Visca, altre amiche e la bella ospite, Berta Angeli. Soltanto alla fine dell'album, nel dicembre 1918, compaiono due uomini con gli occhiali, definiti da Jessie "artisti" ricevuti con rispetto da Riccardo e Cesarina. Gli altri protagonisti sono "le Bestie": Toy (il bianco cane maltese di Riccardo), gli alani, i pavoni, i daini, le papere, i gatti, i maiali, e un piccolo topo, che rallegrano la vita campagnola delle Belle di casa e che danno spunto al racconto. Jessie illustra un viaggio per l'America di Cesarina con partenza da Genova, un doppio a tennis con il parroco, l'ascolto della musica attorno a un tavolo, le prove dalla sarta, l'acquisto delle scarpe, dei cappellini, e una passeggiata delle due Belle in via Roma e in attesa del tram. Due pagine le dedica a sè stessa con cinque scherzose caricature e mentre beve il tè." (da "Jessie Boswell", a cura di Ivana Mulatero, Bolaffi editore, catalogo dell'esposizione tenutasi alla Sala Bolaffi di Torino nel 2009, dove sono pubblicati tutti i disegni del taccuino, pag. 241-251). Cm 12x21,5 . pp. 96. . . Da "Cesarina Gualino e i suoi amici" a cura di Maurizio Fagiolo Dell'Arco e Beatrice Marconi: "Jessie Boswell arriva a Biella nel 1906, su invito di sua sorella Gertie che ha sposato Venanzio Sella, fondatore dell'omonima banca. Nel 1913 entra in casa Gualino, come dama di compagnia. Studia pittura con Felice Casorati e Mario Micheletti e nel 1923, all'età di 42 anni, espone per la prima volta a Torino alla Promotrice delle Belle Arti. Fa parte (per pochi anni) del Gruppo dei Sei. Dotata (a ricordo di tutti) di spiccato humor, di una buona cultura umanistica e artistica, svolge un ruolo più importante di quello inizialmente assegnatole. Anima le serate e suona per gli ospiti il pianoforte (si è diplomata alla Royal Academy of Music di Londra nel 1901), ritrae i padroni di casa, i loro figli, gli interni della casa, organizza i balli, le feste e le recite con i ricchi costumi che i Gualino hanno acquistato nei viaggi in Russia e in Romania. Il 16 aprile del 1928 lascia casa Gualino, e si dedica esclusivamente alla pittura, mantenedosi con lezioni di pianoforte. Con Cesarina è subito amicizia, il linguaggio musicale le unisce, Jessie impara a danzare e Cesarina a dipingere e ad amare gli inglesi. Adelaide, W.K. Thomas & Co., Printers, . 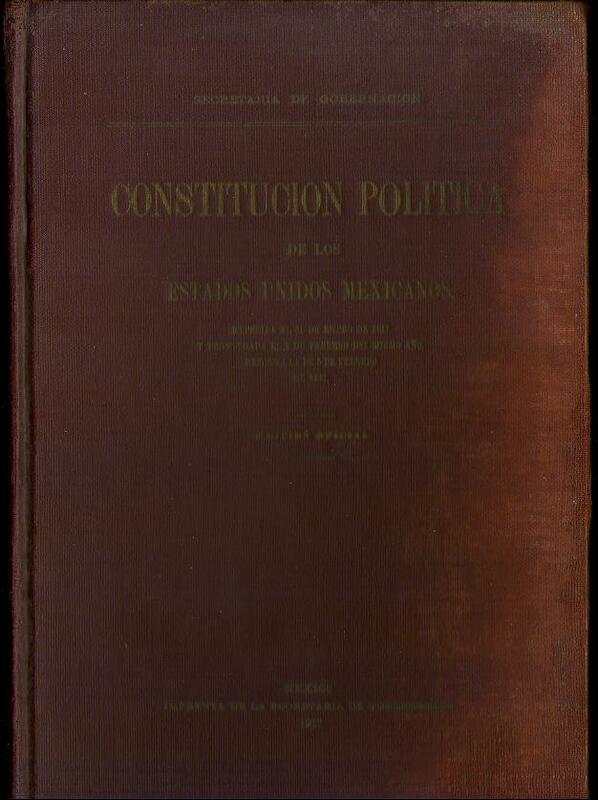 Duodecimo, 144 pages plus 13 plates. 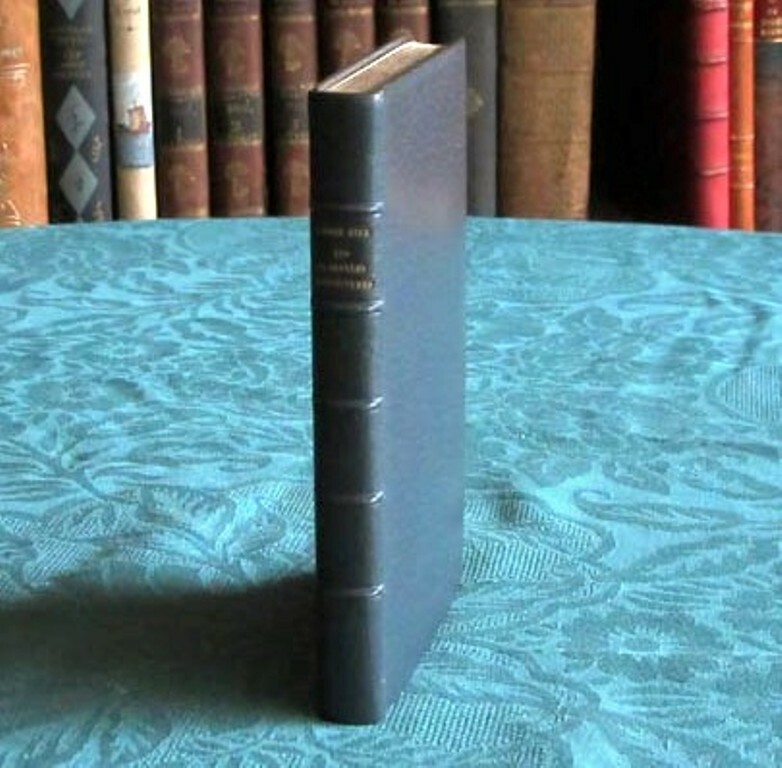 Contemporary blind-stamped binder's cloth lettered in gilt on the front cover; cloth sunned on the spine and a little flecked; an excellent copy bound without the wrappers. 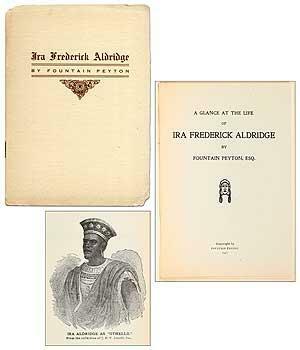 Inscribed, dated (10 November 1917) and signed by the author at the head of the title page to T.G. Souter (an amateur ornithologist from Maitland in country South Australia), with the latter's ownership signature on the flyleaf. In September and October 1916, White accompanied Edgar Waite on a small South Australian Museum expedition north-east from Farina into Burke and Wills country. McLaren 16763. Fine Art Society, 1917. 1st Edition. Hardcover. Very Good Condition/No Dust Jacket. Illustrator: Louis Raemaekers. Book Signed by Author. Two Tone half binding with buckram spine and corners and paper covered boards. Gilt edging and spine detailing. Facsimile signature to paper front. One of a deluxe limited edition of 1050 author signed copies, 1000 for sale. 60 tipped in cartoons, including a tissue protected colour frontispiece Size: Elephant Folio - over 15 - 23" tall. Item Type: Book. Binding is tight, covers and spine fully intact. No foxing in this copy. No Dust Jacket. No inscriptions. Top Edges Gilt. Bumped and Rubbed. Illustrator: Louis Raemaekers. Shipped Weight: Over 3 kilos. Category: Military & Warfare; Art & Design. Signed by Author. Please contact H4o Books if you require images or further information. Inventory No: 026262. .
Katalog der Fima Martini & Hüneke, Maschinenbau-Aktien-Gesellschaft, Berlin, Ausgabe Mai 1917. Ein Kriegs-Tagebuch der Künstler. Hrsg. v. O. Haas-Heye. München & Berlin, Graphik-Verlag 1914-16. Jahrgang 1-2 in 38 Heften. 4to. 608 S. Mit 137 Orig.-Graphiken. Orig.-Brs. mit Deckeltitel. [Australian Electrical Mechanical Mining and Boring Company]. Visible image size 400 x 550 mm, recently replaced in its original deeply-recessed glazed wooden frame with gilt fillet, complete with the original captioned matt (external dimensions 660 x 800 mm). The sepia-toned original vintage gelatin silver photograph is in fine condition; the white ink caption is a little smudged, but still quite legible; the frame is a little rubbed at the extremities and chipped near one corner; overall, it is a very impressive piece. Given the date there is little doubt that this was taken in the Messines sector, where the engineers had their most famous success with the series of enormous mines detonated before the attack on 7 June 1917. 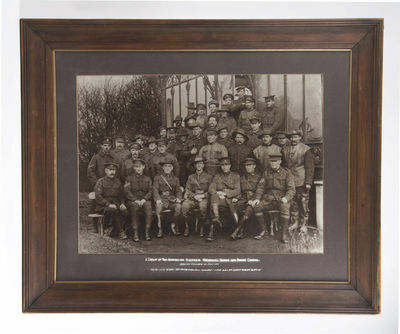 The original caption also notes that 'this group is only 100 strong and yet has been awarded any number of gallantry medals including a DSO, 3 DCMs, 2 MCs and 7 MMs'. The DSO was awarded to the Commanding Officer, Major Richard Victor Morse, on 3 June 1917; he is seated in the centre of the front row. A copy of a letter from Morse to the Controller of Mines, Second Army, dated 12 June 1917, is in the Australian War Memorial collection. The final paragraph may help put this particular image in its true context: 'I also wish to draw your special attention to the very good work of the N.C.O. 's and men ... These men have for the past 18 months carried out their duties under very extreme conditions, and in keeping the supply of power for the front line work, constantly repairing cables under heavy shell fire, and have shown faithfulness to their duty by working weeks in the line without taking relief, and unduly long hours on duty, in the many instances of Engine room and line troubles'. 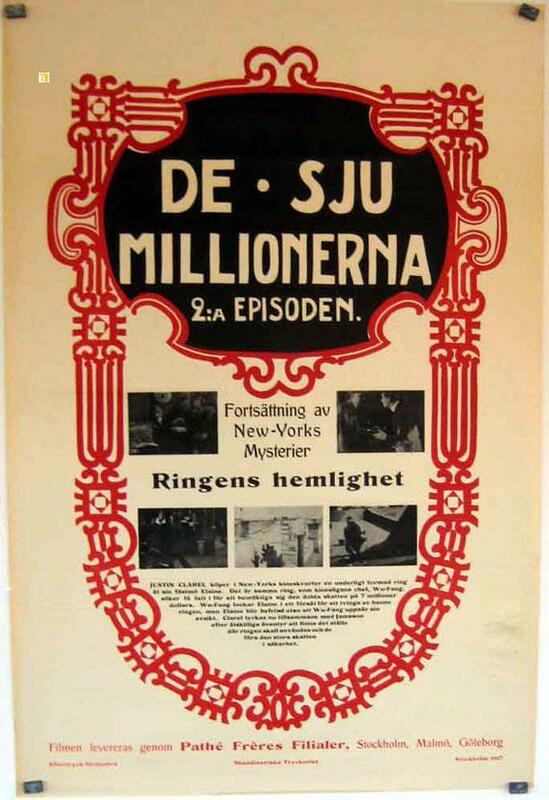 PATHE 1917 - DE SJU MILLIONERNA - 1917, Dir: , Cast: WHITE, , , Nac. film: USA, Company: PATHE, Designer: , , Nac. poster: SUECIA, Measures (Cm. and Inches) : -70X100-Cm.-27X41-INCHES-1 SH., , Type of product: POSTER, , POSTER are in excellent condition but may have normal wear such as edge wear or a slight hole. I try photograph any flaw but examining the photos closely is your best bet! Please see bigger picture for details., , La mayoría están en excelentes condiciones, pero puede tener desgaste del borde o algun agujero pequeño. Intento fotografiar cualquier defecto, pero el examen de las fotos de cerca es su mejor opción! Por favor ver la foto en grande para más detalles., , SHIPPING COSTS: Fold posters SPAIN 15? -Correo certificado EUROPE and all world 20? New Victor Records Jass Band and other Dance Selections. Victor Records. 1917. Poster in tones of brown, black and orange 33 x 21 inches (84x53cm) archivally backed with a one inch wide section down the right edge reattached (a small area of the lower right margin missing) and two short tears at the lower edge minimised. Scene of couples dancing in a ballroom, with orchestra playing. Tunes listed are Dixieland Jass Band, Livery Stable Blues, Poor Butterfly and Allah's Holiday. Bottom right are the initials 'RW'. 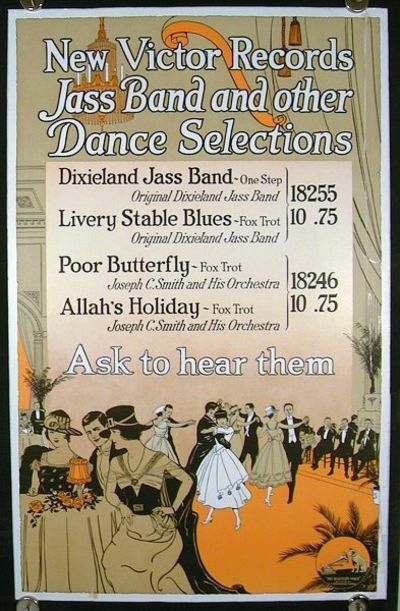 A facsimile letter from the Victor Talking Machine Company to Victor Dealers reads in part: "The Jass Band is its own best advertisement to people who have heard it but for those who have not, we have had the enclosed poster prepared. Given the best possible display you have at your disposal, this new poster, featuring the first Jass Band selection and one other excellent dance record, will develop a very considerable volume of business for all our Dealers. The Jass Band is a novelty. It is the newest and the noisiest thing in the cabarets. Coming just at the end of the winter season it will carry the dancers merrily along into the summer months and like all musical novelties, it means the beginning of another special 'run' of business." Little did the Victor company know just how long that 'run' would last... We have found only one holding at Tulane University in the Hogan Jazz Archive. 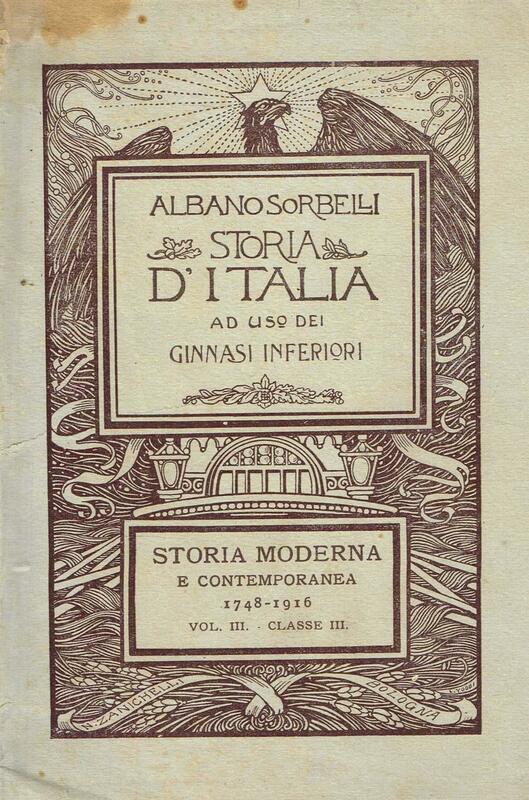 ZANICHELLI, BOLOGNA 1917 - ITALIANO II edizione riveduta, con una carta geografica a colori, 19 cartine e 90 figure, pagine brunite da fattore tempo, con lieve fioritura e con traccia di umidità ai bordi superiori, legatura lenta, presenza di sottolineature ed appunti a matita alla prima metà del volume, brossura editoriale illustrata, con fioritura e traccia di umidità, strappi con mancanze ai bordi, nastro adesivo al dorso La libreria offre per un periodo limitato uno sconto del 20% su tutti i suoi libri. Il prezzo originale dell'articolo era 900,00 euro. Victor Records.. 1917.. Poster in tones of brown, black and orange 33 x 21 inches (84x53cm) archivally backed with a one inch wide section down the right edge reattached (a small area of the lower right margin missing) and two short tears at the lower edge minimised. Scene of couples dancing in a ballroom, with orchestra playing. Tunes listed are Dixieland Jass Band, Livery Stable Blues, Poor Butterfly and Allah's Holiday. Bottom right are the initials 'RW'. A facsimile letter from the Victor Talking Machine Company to Victor Dealers reads in part: "The Jass Band is its own best advertisement to people who have heard it but for those who have not, we have had the enclosed poster prepared. Given the best possible display you have at your disposal, this new poster, featuring the first Jass Band selection and one other excellent dance record, will develop a very considerable volume of business for all our Dealers. The Jass Band is a novelty. It is the newest and the noisiest thing in the cabarets. Coming just at the end of the winter season it will carry the dancers merrily along into the summer months and like all musical novelties, it means the beginning of another special 'run' of business." Little did the Victor company know just how long that 'run' would last... We have found only one holding at Tulane University in the Hogan Jazz Archive. .
1917. Hi, This lot is an 1917 Original Hardback Wisden. 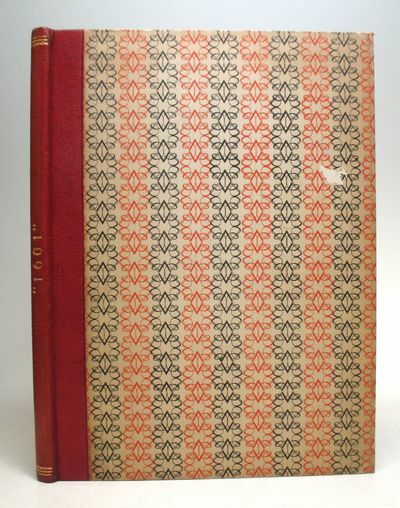 In Superb condition The World War One Hardbacks are very rare, especially in this condition. The boarda are very clean with excellent, extremely bright gilt to the front and the spine, one tiny bit of rubbing can be seen to the bottom left of the front board by the spine) to the top, the rear board is near perfect and the spine gilt is very bright and original. The hinges are very strong and the yellow pastedowns in top condition and very bright yellow. Name to pastedown top and internally a nice clean book. This book is as good as mine on my shelf, if not better, my copy has a slightly darker spine cloth but it is signed by Pardon (if you prefer that one , please email me as I cant decide which one to own). 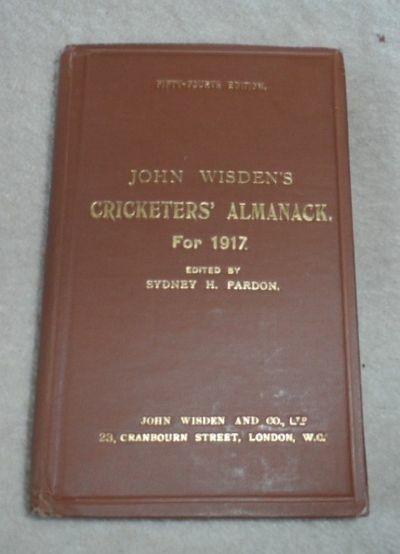 A rare Wisden in superb condition (++) and a very nice price. 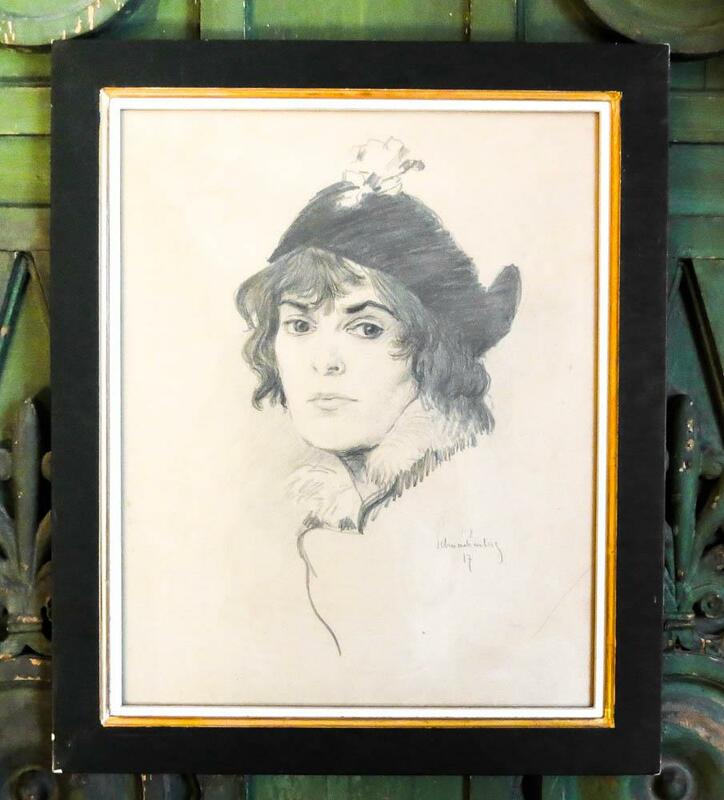 Original-Zeichnung in Kohle und Bleistift, Portrait einer eleganten jungen Dame mit Hut. 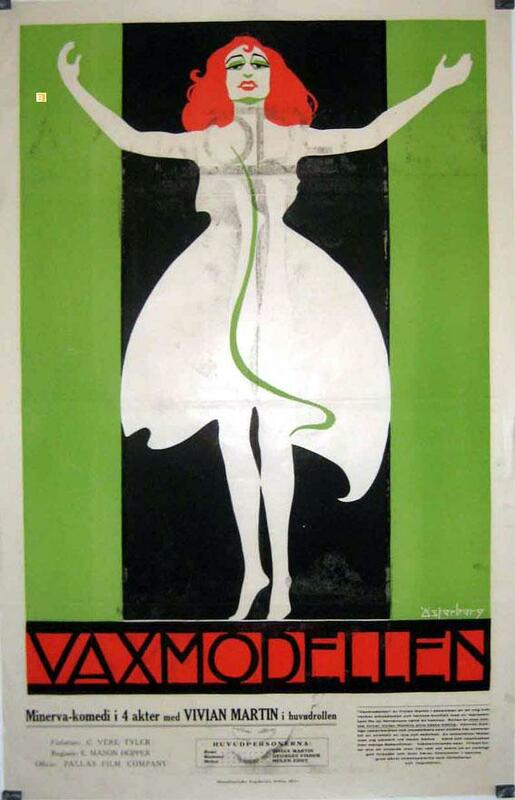 Pallas Pictures 1917 - VAXMODELLEN - 1917, Dir: E. Mason Hopper, Cast: VIVIAN MARTIN, Thomas Holding, , Nac. film: USA, Company: Pallas Pictures, Designer: ASTERBERY, , Nac. poster: SUECIA, Measures (Cm. and Inches) : -70X100-Cm.-27X41-INCHES-1 SH., , Type of product: POSTER, , POSTER are in excellent condition but may have normal wear such as edge wear or a slight hole. I try photograph any flaw but examining the photos closely is your best bet! Please see bigger picture for details., , La mayoría están en excelentes condiciones, pero puede tener desgaste del borde o algun agujero pequeño. Intento fotografiar cualquier defecto, pero el examen de las fotos de cerca es su mejor opción! Por favor ver la foto en grande para más detalles., , SHIPPING COSTS: Fold posters SPAIN 15? -Correo certificado EUROPE and all world 20? New York: Harper & Brothers Publishers, 1917. First Edition. Hardcover. 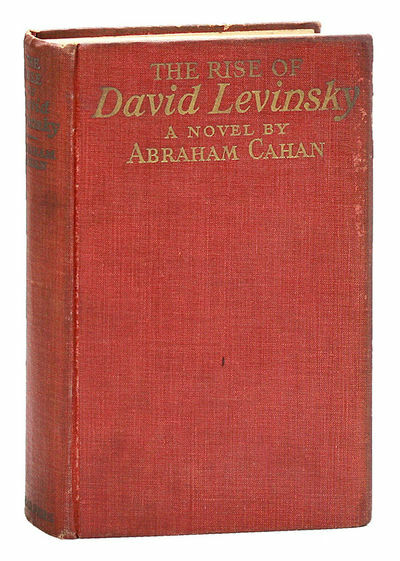 One of a handful of truly great novels of the Jewish experience in America of the 20th century, this an account of a Jewish immigrant who becomes a millionaire garment manufacturer, continuously in print since its first appearance in 1917. Includes description of Levinsky, who starts out as a garment union member, participating in some of the strikes of the period. Signed gift inscription by Jewish-American Olympic gold medalist heavyweight boxer Samuel Berger to Bobby North, vaudevillian later turned film-maker, best known at the time for his act as a "Hebrew Impersonator." 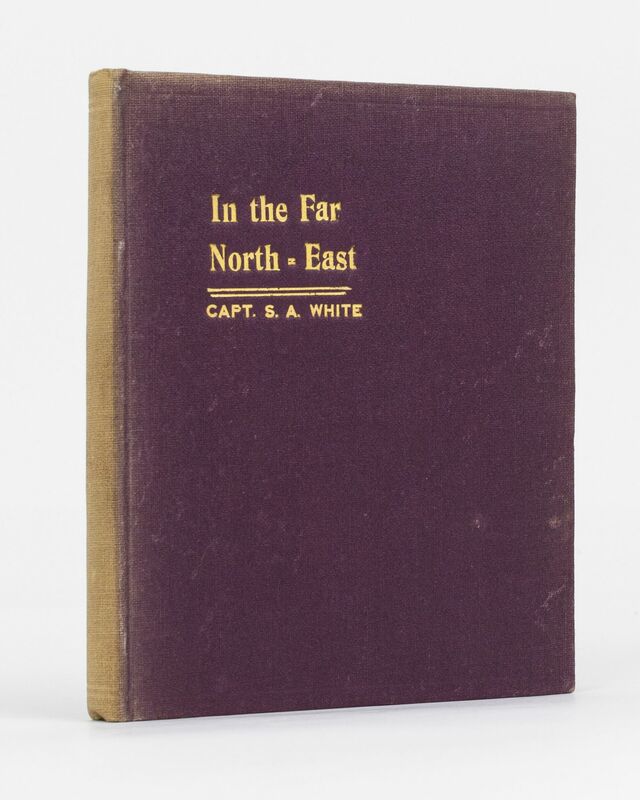 The inscription, dated July 10, 1918, reads "To My Friend Bobby North, Knowing that his knowledge and appreciation of the subject with which it deals will make this pleasurable reading." Interestingly, much like the novel's protagonist, upon retiring from professional boxing, Berger became a successful businessman, the operator of a clothing store in San Francisco. BLAKE, p. 106. HANNA 556. RIDEOUT p. 294. Octavo (18cm). Red cloth boards, upper cover lettered in gilt; spine lettered in green; ,529,,(blank),(ads)pp. Mild signs of use to boards, spine a touch faded, some light insecting to fore-edge, textblock edges unevenly discolored; still, Very Good overall. The Princess Louise Scottish Hospital for Limbless Sailors and Soldiers at Erskine House with Photogravures by James Craig Annan. 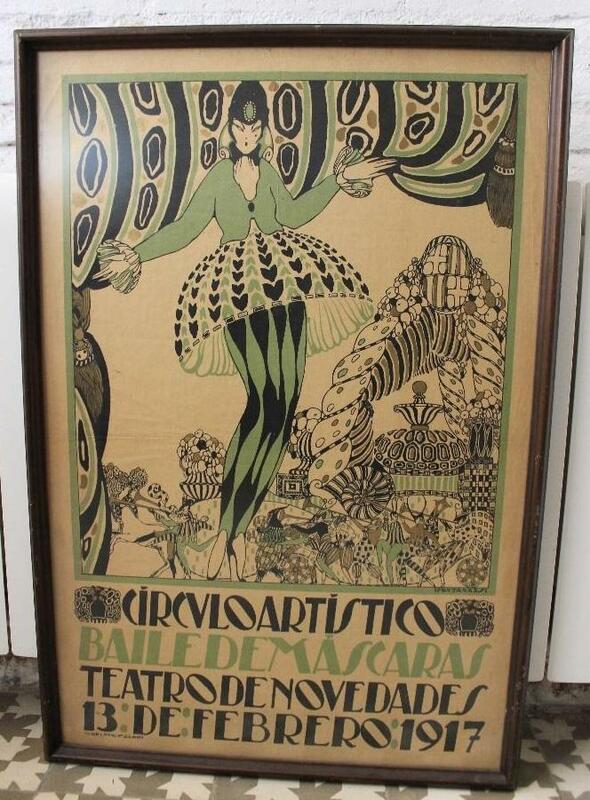 Cartel Litográfico Real Círculo Artístico de Barcelona, Baile de Máscaras. Teatro de Novedades. London: Heinemann,, 1917. and Other Poems. Octavo. Original grey boards, white paper title label to spine printed in green. With the dust jacket. Some rubbing to ends and corners, stain to head of spine, otherwise the book itself remarkably smart, sound and internally clean, split to the rear joint of the jacket with internal repair, some loss to spine ends, light rubbing to extremities and a few minor marks. First edition, first impression, with very scarce dust jacket. 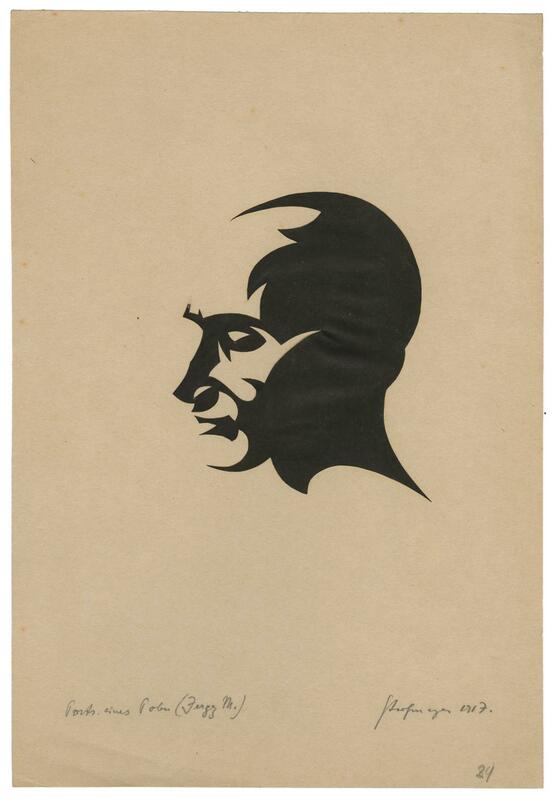 This is Sassoon's first collection of war poetry. Supremacy of the British Soldier. [Great War Ephemera]. London: Darling and Son, 1st May 1917.. ORIGINAL PROPAGANDA LEAFLET. A single sheet of paper (22 x 14cm), printed on both sides. Lightly browned to edges; a few chips from edges. A very good survival of a fragile production. 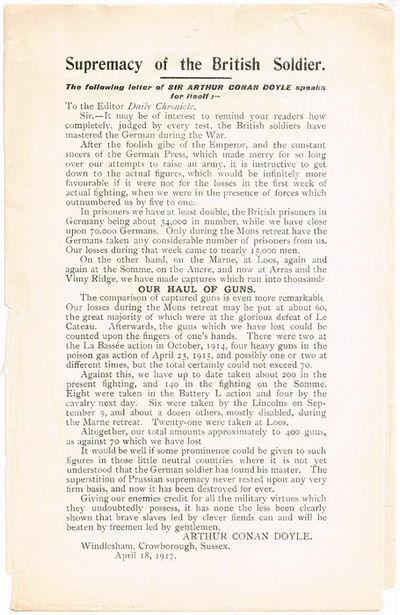 A rare leaflet written by Doyle, who wrote many propaganda publications for the British Government during the First World War. In this one he favourably compares the numbers of troops and guns captured by the British during the course of the hostilities on the Western Front to those captured by the Germans. Toronto: McClelland, Goodchild & Stewart, 1917. First Edition. Hardcover. Very Good/Good. 346 p. Colour frontispiece by M. L. Kirk. 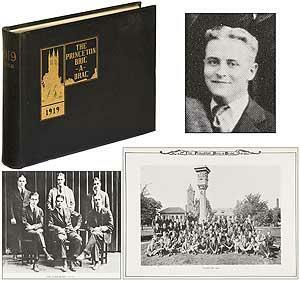 Mauve pictorial hardcover. In dustjacket with numerous chips and small tears. Ink signature on front free endpaper. A first edition of book five in the "Anne" series, chronicling Anne and Gilbert's early married life. 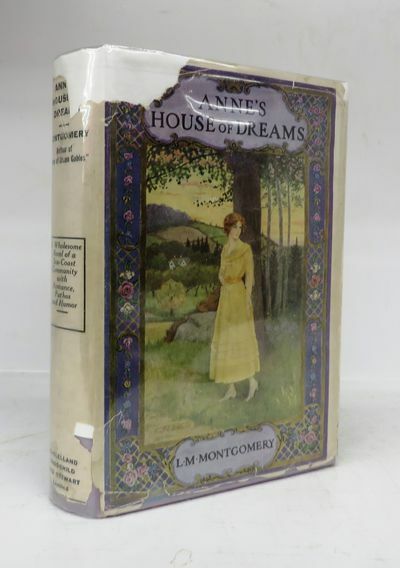 After Anne and Gilbert's wedding, they move to a house that Anne has long anticipated as her "house of dreams" in Four Winds Point. A bittersweet novel, since events in Anne's life soon reflect similar unfortunate occurrences in the life of the author. 1917. London: Frederick Warne and Co., n.d. . 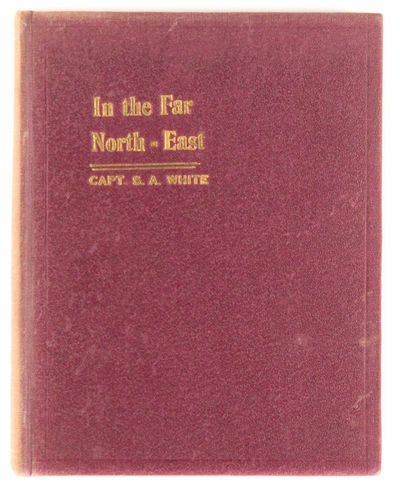 Original green-grey boards lettered in red, with front cover pictorial onlay. 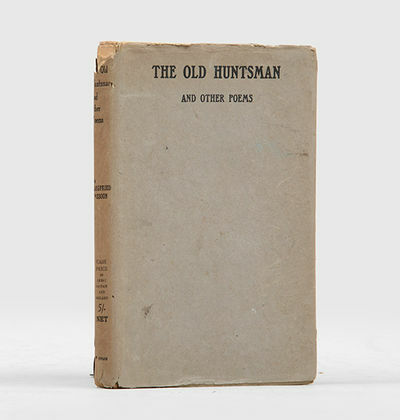 First Edition (first or second printing, indistinguishable from each other, which came out in October and November 1917). 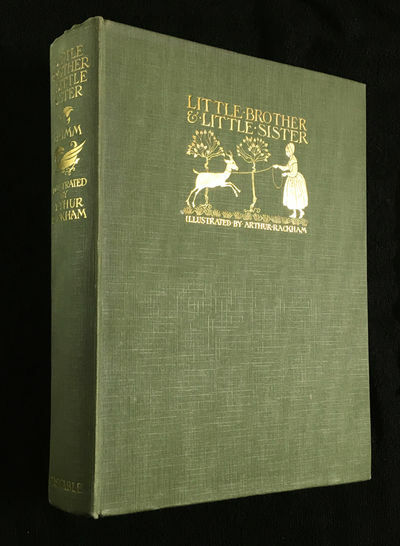 The third printing did not come out until 1919-1920; it is distinguishable from the earlier two, because for the third printing "Ltd." was added to the publisher's name on the front cover and title page.~Most of these rhymes are Beatrix Potter's own, but also included is "You know the old woman who lived in a shoe?". 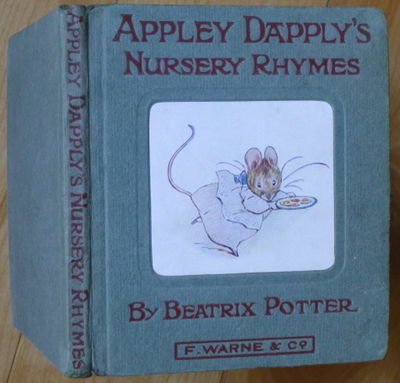 She first did illustrations for that rhyme as early as 1893, and she and Warne planned a volume of illustrated verse soon after PETER RABBIT made such a hit in 1901-1902. However it kept getting set aside for other volumes, and then Norman Warne died in 1905, and the project was dropped for a dozen years -- when in 1917 Fruing Warne asked her for another story and she did not have one. (Five years later there would be another volume of rhymes, CECILY PARSLEY'S NURSERY RHYMES. )~This copy has the binding's lettering in red (others have it in dark green -- no precedence). Condition is near-fine (just a hint of wear at some corners). Covering the front paste-down illustration is the large bookplate of Ula Pegatha Dashwood Howard (who was baptized in Hampton Hill in August 1909); the front paste-down illustration is different in the third printing, but we know that this unseen illustration is in the earlier state because of the lack of "Ltd." elsewhere. Linder pp 225-229 & p. 430; Quinby 23. SAUDI ARABIA. ; HAMILTON Lieut.-Col. R.E.A. 962 Seiten mit zahlreichen Illustrationen (z. T. auffaltbar), 22 cm Halbleinen mit goldgeprägtem Rückentitel ( wohl private Bindung) Gut erhaltenes Exemplar mit leichten Gebrauchsspuren. Auf den Vor- und Nachsätzen wurden Zeitungsausschnitte über Senftenberg eingeklebt. Buchblock im Mittelteil gebrochen. Bindung trotzdem fest. Schönes Exlibirs auf Einbandinnendeckel. Innen schön und sauber erhalten. BITTE BEACHTEN: Die Seiten 546 bis 566 fehlen hier wurde eingebunden: "Chronik von Senftenberg Heft 18: Die Margakirche / Das Reformationsjubiläum 1917 / Die Glocken der Senftenberger Hauptkirche. 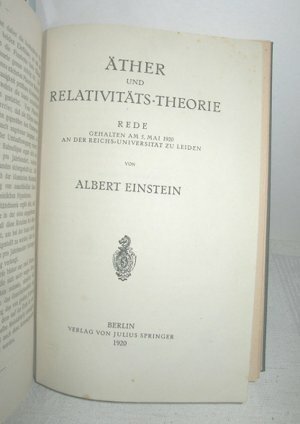 v. G. Paulitz (1922), 22 Seiten (ev. ist dies der fehlende Teil, da die Chronik ursprünglich in Einzelheften erschien). Dann wieder fortlaufend und endet bei Seite 962. Das Original hat 986 Seiten! Es fehlen wohl die letzten 24 Seiten. Täglicher Versand. Jede Lieferung mit Rechnung und ausgew. MwSt. First edition. Small 4to., original plain red wrappers. S.I. [Privately Printed]. Garden City, NY: Doubleday, Page & Co, 1917. Memorial Edition/Edition De Luxe, Copy D of 1075. The Publisher's Copy. Frontispiece signed by Grant and the Memorial Edition vignette page by publishers Doubleday, Page & Co. With illustrations by Gordon Grant. Printed at the Country Life Press, Garden City, N.Y., on laid paper watermarked with monogram of O and H. 14 vols. 8vo. 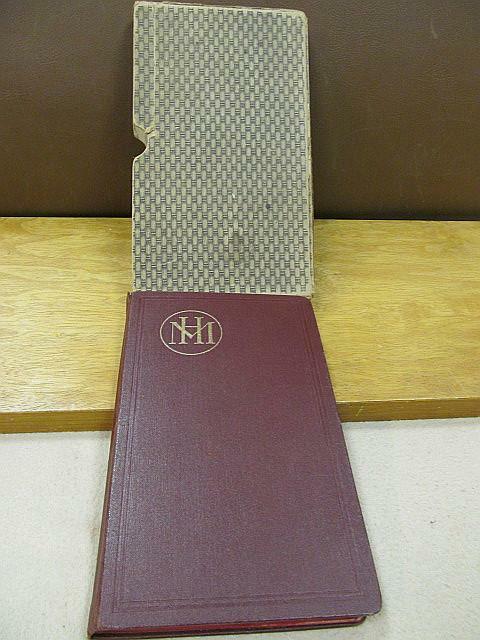 Full burgundy morocco gilt, turn-ins gilt, t.e.g., by the French Binders. With the bookplate of the publisher Nelson Doubleday in each volume. Fine condition. Grant, Gordon. Memorial Edition/Edition De Luxe, Copy D of 1075. The Publisher's Copy. Frontispiece signed by Grant and the Memorial Edition vignette page by publishers Doubleday, Page & Co. With illustrations by Gordon Grant. Printed at the Country Life Press, Garden City, N.Y., on laid paper watermarked with monogram of O and H. 14 vols. 8vo. 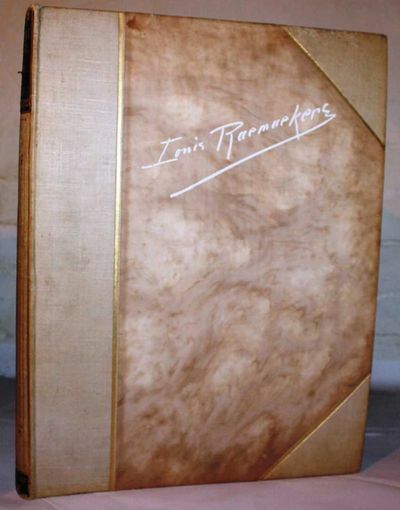 PUBLISHER'S COPY, BOUND BY THE FRENCH BINDERS. From the entry on Waifs and Strays (BAL 16301), first issued in an edition of 200 copies and as vol. 14 of the Edition De Luxe of the Complete Writings: "BAL has been unable to find any publication information for this issue but note that the bookseller Gabriel Wells announced a fourteen volume set, Edition De Luxe, in PW Oct. 6, 1917 ... Presumably Wells handled the entire issue." Not quite. Rech' Lenina po agrarnomu voprosu. (Proiznesena 22-go maia 1917 goda na Vserossiiskom Sovete Krest'ianskikh Deputatov) [Lenin's speech on the agrarian question. 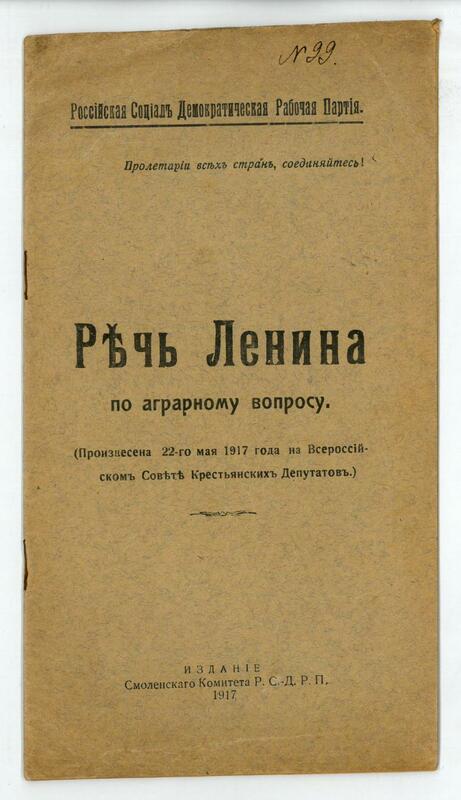 Held on May 22, 1917 on the All-Russian Congress of Peasant Deputies]. Imbottigliature. Sono misure e straripamenti spirituali. Prefazione di Maria Ginanni. 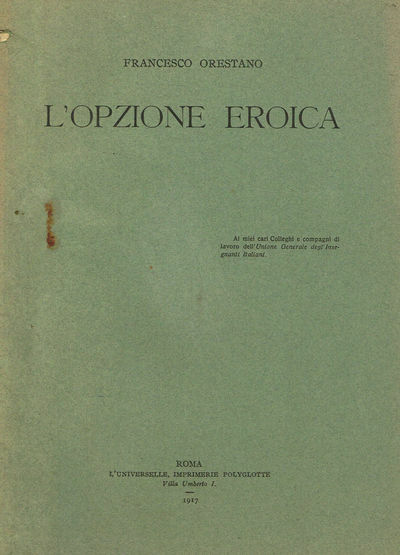 Firenze, Edzioni de L'Italia Futurista, 1917, in-8, piccolo. br. edit. illustrata, pp. 144. Con ritratto fotografico di Conti di Nunes Vais su una tav. f.t. Prima edizione. Bell'esemplare. Cammarota 120.2. Komplette Mappe mit 40 Plakaten.Insgesamt gibt es 3000 Exemplare.Plakatmappe wurde in Rom gedruckt. Dayton OH, 1917. 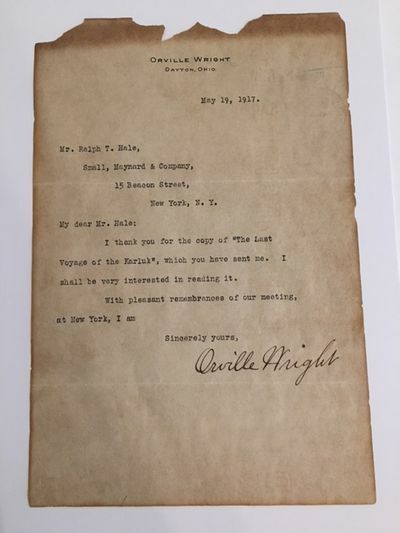 One page letter on Orville's personal stationary, folded twice. Browning and chips at the top and edges of the letter. "Mr. Ralph T. Hale, Small, Maynard & Company, 15 Beacon Street, New York, N. Y. | My dear Mr. Hale: I thank you for the copy of "The Last Voyage of the Karluk", which you have sent me. I shall be very interested in reading it. With pleasant remembrances of our meeting, at New York, I am Sincerely yours, Orville Wright." Hi, A set of 3 Wisdens, in a run from 1917 to 1919 all Rare Paperback Wisdens. The books are in good+ condition, nothing mint but they are nice books. The books are all tightly bound, odd mark to the covers and some read feel, the 1919 has a large mark to the spine, the 1917 and 1918 have some tape on the spine, internally super. Some faking to the spines. A nice set. More photos on request. 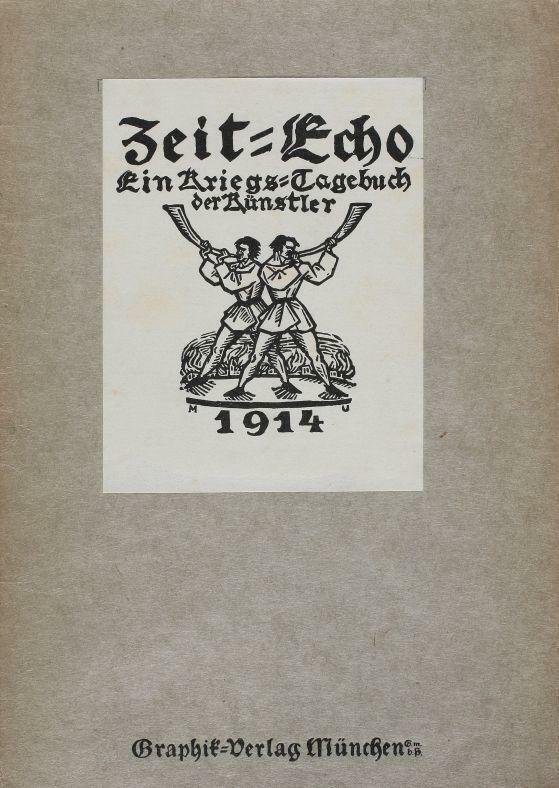 - Scherenschnitt, 1917, auf chamoisfarbenes Papier geklebt, links unten bezeichnet &#132;Portr. eines Polen (Jergz. M.)", rechts unten signiert und datiert &#132;Strohmeyer 1917.". Blattgröße 23,7:16,2 cm. Strohmeyer war Mitarbeiter der Wochenschrift für freiheitliche Politik und Literatur &#132;Die Aktion", dem Sprachrohr der expressionistischen Kunst, erschienen in 22 Jahrgängen von 1911-1932. Des Künstlers Beiträge stammen aus den Jahren 1915-1919. Franz Pfemfert 1879-1954, Publizist) widmete Ottheinrich Strohmeyer das DIE AKTION-Sonderheft STROHMEYER, VII. Jahr, Nr. 47/48, 1. Dez. 1917 mit 14 Original-Holzschnitten Strohmeyers. Philadelphia, 1917. Limited. hardcover. fine. 4 copperplate etchings by J.P. Nuyttens, including a fine frontispiece of Twain. 4to, original leather backed decorative boards. (Philadelphia) Printed at ye signe of ye flea, in ye citie of brotherly love, n.d. Limited Edition. Fine. Scarce edition of this frequently reprinted pornographic "Tudor conversazione" Printed on Japan paper, on one side only, with initial letters only partially illuminated. The etchings are dated 1917 in the plate. Bound in at the end is a membership certificate in the Flatulence Society.